Gold softened overnight in a range of $1243.10 - $1237.45, trading against strength in the US dollar. The DX firmed from 97.07 – 97.62, boosted by weakness in the yuan (6.880 – 6.902, weaker Retail Sales, Industrial Production) the pound ($1.2660 - $1.2555, May fails to make progress on Brexit on her trip to Brussels), and the euro ($1.1365 - $1.1285, weak Eurozone PMIs, Draghi’s comments yesterday still resonating). Global equities were lower and gold supportive, hurt by the weaker economic data from China with the NIKKEI -2%, the SCI off 1.5%, European shares were off from 0.8% to 1%, and S&P futures were -0.9%. Lower oil prices (WTI from $53 to $52.13, soft Chinese data soften demand prospects) weighed on stocks. At 8:30 AM, US Retail Sales were stronger than expected (0.2% vs. 0.1%, with last month’s Sales revised up from 0.8% to 1.1%). S&P futures rose to 2628, while the US 10-year bond yield moved up to 2.893%. 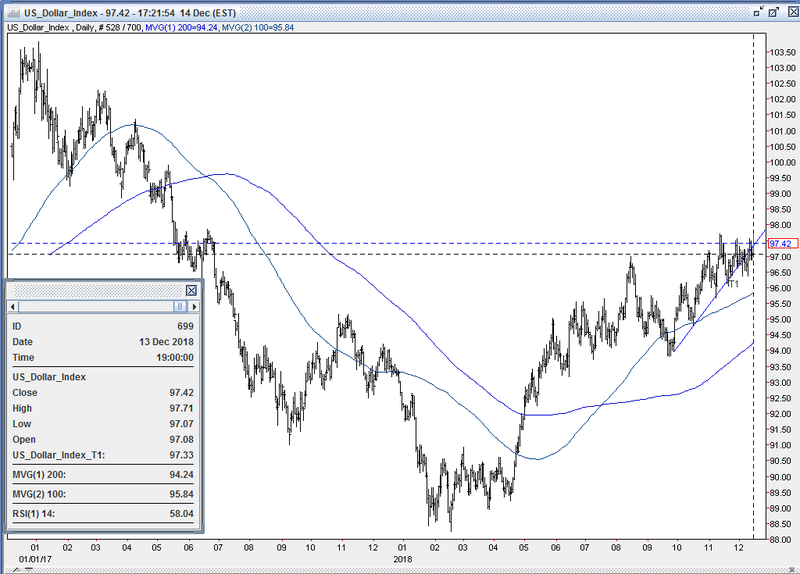 The DX popped to 97.71, taking out last month’s 97.70 top to make a fresh 18-month high. Gold plunged in response, taking out stops below the overnight low and $1237 (12/7 low), $1235 (12/6 low) on the way to $1233 – where support at the 12/5 low held. A fair amount of long liquidation was seen. At 9:15AM, US Industrial Production was also better than expected (0.6% vs. exp. 0.3%), and US stocks through their open (S&P -15 to 2635). The 10-year yield ticked up to 2.90%, but the DX came off its high (profit taking) to 97.60. 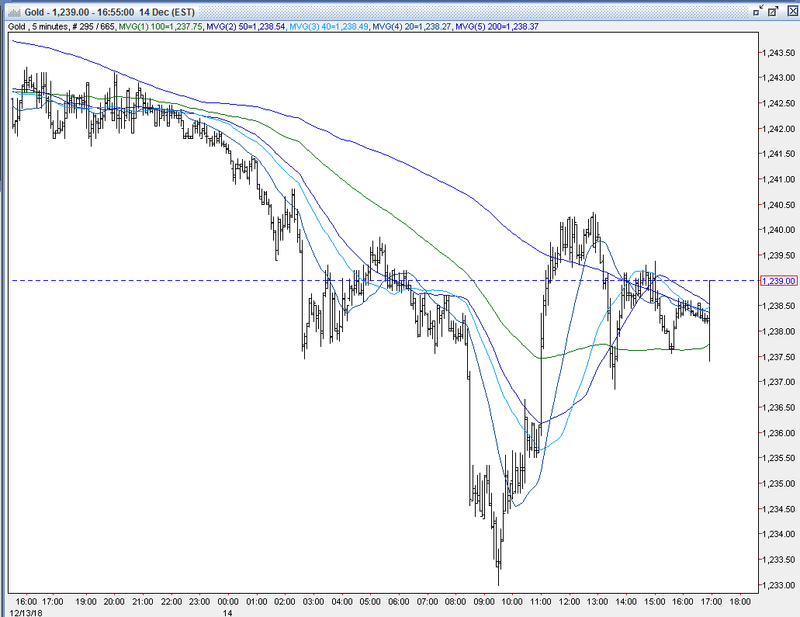 Gold was caught in the cross currents, and traded up to $1235. Later in the morning, US stocks turned down (S&P -44 to 2606), with losses in J&J (report the company knew for decades about asbestos in baby powder), and the Health Care, IT, Consumer Staples, and Energy sectors led decliners. The weaker Chinese data reported last night exacerbated concerns of a global economic slowdown, and further drop in oil contributed to the move (WTI to $50.97). The 10-year yield declined to 2.879%, and the DX retreated to 97.45. 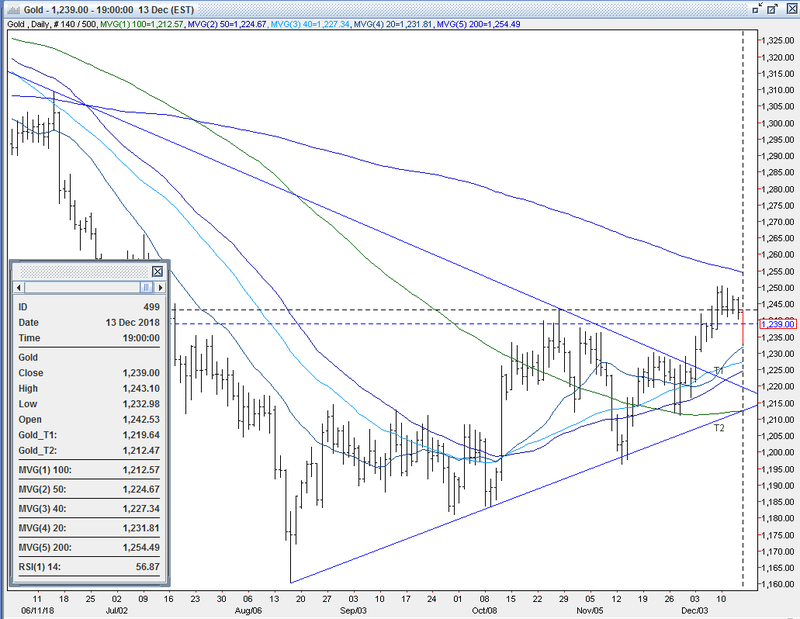 Gold rallied back in response, tripping some buy stops over $1235-37 to reach $1240. Into the afternoon, equities pared some losses (S&P – 32 to 2619), while the 10-year yield ticked up to 2.898%. The DX edged up to 97.51, and gold pulled back to $1237. Later in the afternoon, US stocks took out their earlier low (S&P finished off 51 to 2600), while the 10-year yield moved down to 2.882%. The DX remained steady around 97.45, and gold was likewise stable between $1237.50 - $1239. The yellow metal was $1238 bid at 4PM with a loss of $4. Open interest was off 4k contracts, showing a net of long liquidation from yesterday’s decline. Volume remained subdued and a tad lower with 167k contracts trading. The CFTC’s Commitment of Traders Report as of 12/11 showed the large funds cutting 3.4k contracts of longs and 14.9k contracts of shorts to increase their net long position to 60k contracts. 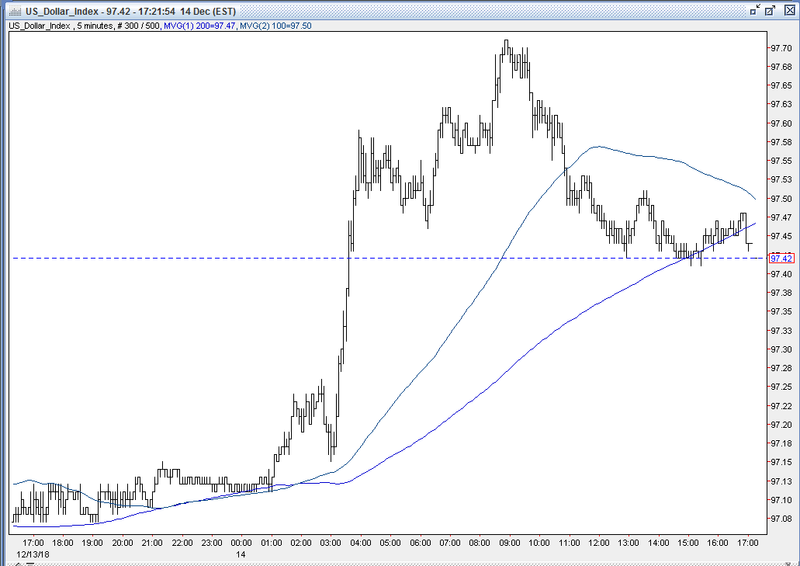 This was done during gold’s rally from $1230 on 12/4 to $1250 on 12/7. While the funds’ net long position increased significantly for the 2nd consecutive week, it is still historically and comparatively very low. This still sets up the gold market very well to move sharply higher as the short side of gold is remains a crowded trade. With many longs still on the sidelines and a very large gross short position still remaining (109k contracts), gold just needs a significant spark to unleash heavy buying from shorts covering and sidelined long-side players returning. While some bulls were disappointed that gold wasn’t able to finish with a gain given the clobbering stocks took, and with the US 10-year bond back under 2.90%, other bulls were relieved that gold held as well as it did given the dollar made a fresh 18-month high. Bulls remain steadfast in their thinking that gold bottomed at $1160 on 8/16 after a $35 2-day capitulation. They still have an uptrend in place from that level, and will look to continue to add to long positions on weakness, or on some expected ensuing upside momentum. Bulls strongly believe that the dollar’s recent climb from its 9/21 93.81 low to today’s 97.71 high (+4.16% to fresh 18-month high) is badly overextended and expect a correction to drive a significant short covering rally in gold. Bulls are looking for continued financial market turbulence to re-test resistance at $1250 and then challenge $1255 – the 200-day moving average. Bulls feel a breach above the 200-day moving average will be consequential to launch a sharper upside move. In addition, bulls maintain that today’s Commitment of Traders Report still shows the funds with a very large gross short position (109k contracts). They feel the that the short side of gold is still a very crowded trade and that the gold market is still set up in a highly favorable position to move up from potential heavy short covering and sidelined longs returning to the market. Bears were encouraged that the strength in the dollar that was able to push gold lower today – despite equities getting hammered. Bears remain comfortable selling into strength, feeling moves toward overhead resistance at $1250 and $1255 will continue to provide good entry points for short positions. Bears point to the lack of follow-through gold has presented on recent rallies, and that the fairly heavy amount of short covering seen thus far from the prior few week’s COT reports (another 15k contracts of covering in today’s report) has failed to lead to a breach of at least $1250 - as signs of a tired market – and expect a significant pullback to unfold. Many bears are firm in their conviction that fuel from dollar strength and a rebound in equities will provide downside pressure on gold and see prices north of $1200 offering a great opportunity to get short(er). This is witnessed by today’s COT Report that shows a very large gross short position (109k contracts) still remains. Bears will look for a breach of initial support at the trendline at $1221 to bring about a re-test of $1212 (100-day moving average, double bottom, the up trendline from 8/16 $1160 low), and then expect to challenge $1200. All markets will continue to focus on geopolitical events (especially Brexit developments), developments with the Trump Administration (especially on US-China trade, potential legal issues), oil prices, and will turn to reports Monday on Eurozone’s Trade Balance, CPI, US Empire State Manufacturing Index, and NAHB Housing Market Index for near-term direction.